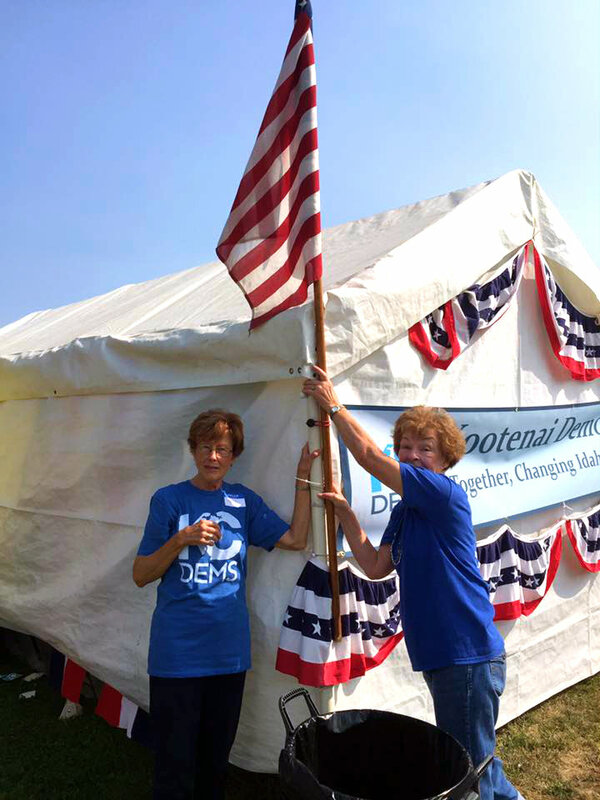 2017 Dem Fair Booth: An Unqualified Success! The 2017 North Idaho Fair is now history. 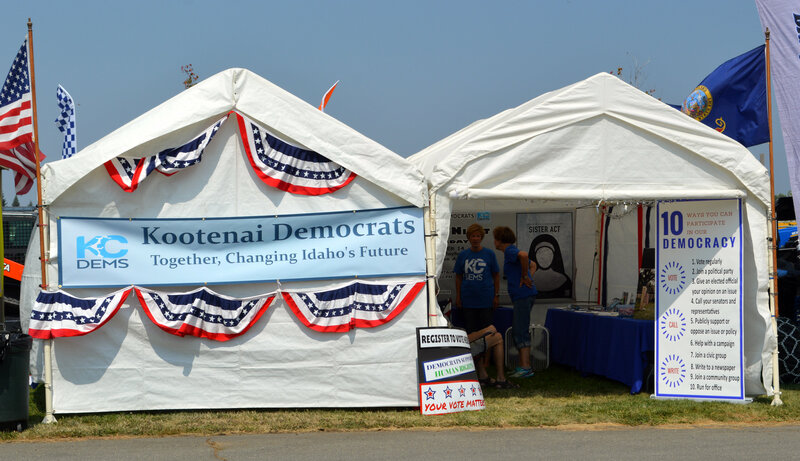 The “Democratic Booth at the Fair” is an annual event of the Kootenai County Democratic Central Committee and is accomplished by much expense, planning, and dreaming up new ways to encourage people to visit the booth. 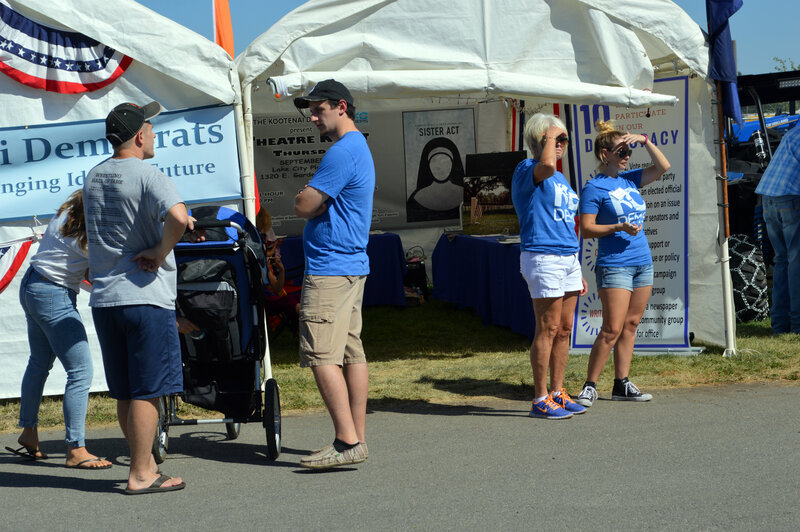 To answer the oft-posed question “Was the Fair a success?” I offer several responses. A simple tally of the results reveals that 31 volunteers covered 17 shifts, set-up/take-down, and decorating; approximately 40 people completed voter registrations; 30 people signed up to volunteer with the Democrats; our volunteers initiated at least 126 conversations with passersby and purposeful visitors who answered our question “What is one issue related to our county that most concerns you?” This question proved to be a great opening for conversations with people who were passing by the booth with no intention of stopping until our intrepid volunteers stepped out of their comfort zone to ask them. Of course, some people, once asked, could not contain themselves with a single issue and gave multiple responses. Other issues garnered 1-6 votes each: Climate change and respect for science; community involvement and local issues of growth, housing, and governing; public lands and conservation; Democratic issues and union support; jobs, wages, poverty, and the social safety net; taxes, spending, food tax; justice system reform; transportation; suicides; history rewritten or distorted. We offered several items free and for sale, but the total of funds collected is not yet available; however, we never expect to make money at the Fair, only to cover the expense of having the items available. Buttons, stickers, and bumper stickers gathered a few donations, and we sold t-shirts with our new logo. Thriftiness being a Democratic value, we finally cleaned out our last year’s supply of still pertinent bumper stickers and distributed a few more of our “environmentally friendly” fans (old fashioned hand-held paper fans) with our old donkey logo and contact information. They helped cool appreciative visitors during the heat of the day. While some folks came in asking for free stuff, our primary method of drawing in visitors was clearly our questions and smiling faces. Of course, success cannot be determined simply by counting data, but by the connections between volunteers and visitors. 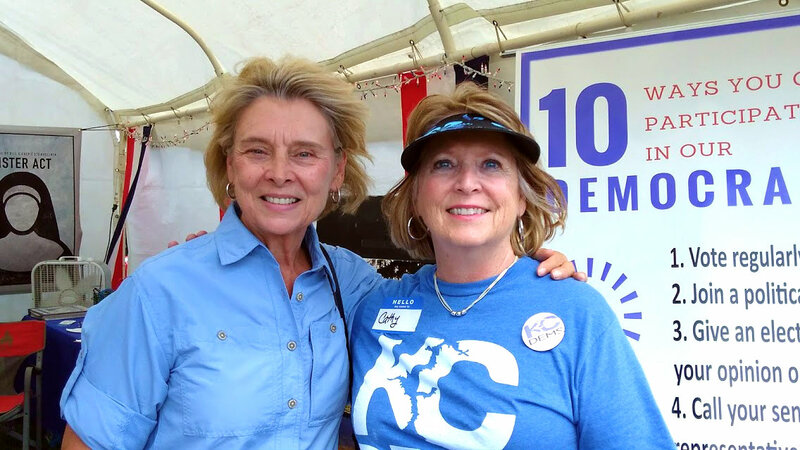 Cathy Kraus was surprised and honored by former Washington Governor Christine Gregoire’s visit to our booth. 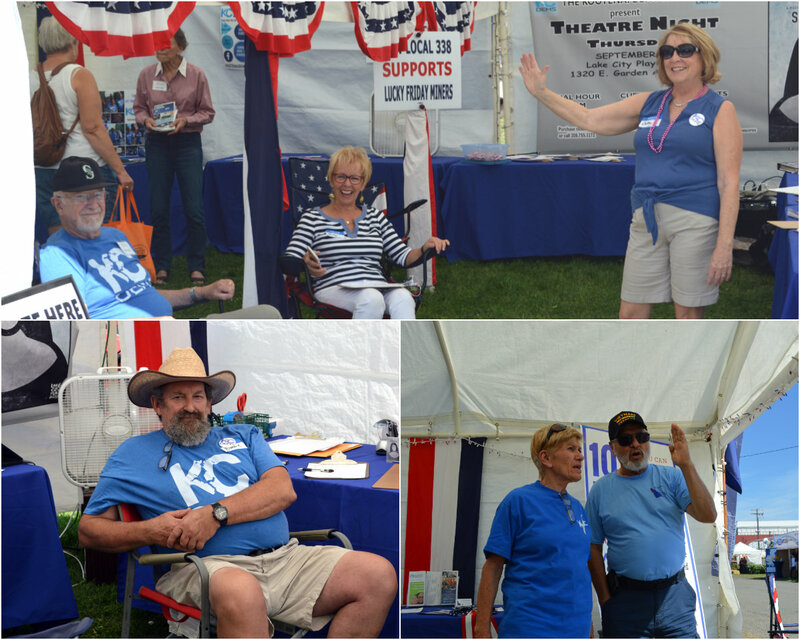 As Chair of the Kootenai County Democrats, I was again encouraged by the number of Democrats who come by to check out how we are doing and give us a thumbs-up. A young woman who identified herself as a construction worker from Oregon said she came by to talk with “my people!” No volunteer reported any significant bad experience, besides the usual under-the-breath snide comment and the studious eye-avoidance by so many passersby. A somewhat discouraging interchange was a derisively toned comment from a Fair employee to Cathy when she asked about the Fair’s recycling program (there is none): “Oh, you’re a Democrat; you would want to recycle.” If that was the worst we heard, then this year’s event was, in spite of the current political situation, surprisingly as mild as past years. Volunteer Jo Sausen recounted that when a group of teenaged boys entered the tent together to ask for Trump hats, Ruben “set up a classroom” to listen and share. Our thanks go to Cathy Kraus, Fair Committee Co-chair with me, who faithfully took pictures and posted them to Facebook with the hashtag #kootenaidemsfair2017 and helped with everything; to Larry Telles, our stellar photographer who visited our booth regularly during the week to catch us working; to Ruben Miranda who coordinated the setup and takedown of the two large tents that are essential to our booth and who also produced two snazzy banners which featured our new Kootenai County Dems logo and Theater Night: Sister Act, our next fundraiser, on September 14. Our setup and takedown crews also included Richard Rolland; Cathy, Laurie, and Geoff Kraus; and Chris Matthews. 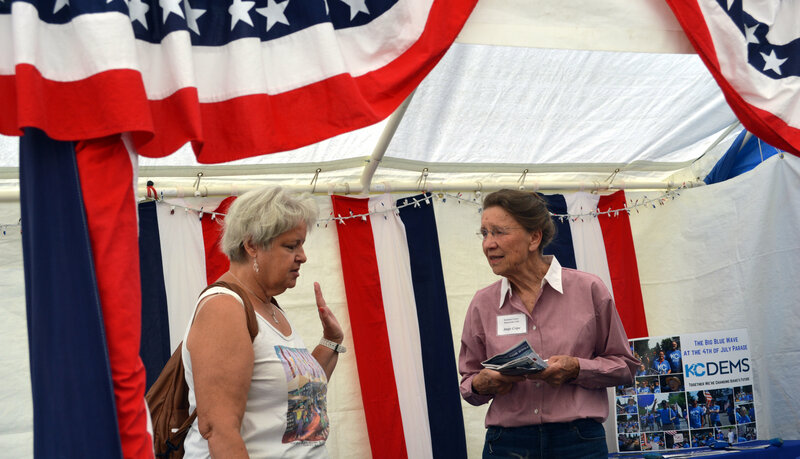 More thanks go to Janet Callen who works on organizing the fair volunteer handbook and directing the decorating of the tent. 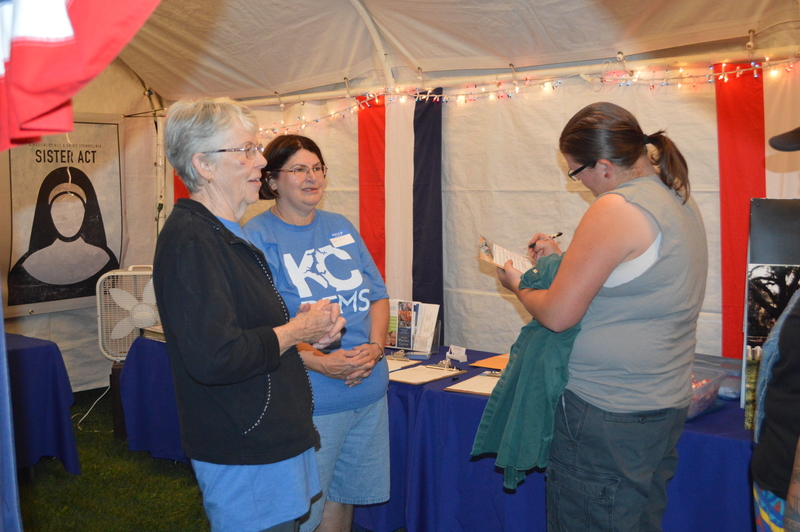 Her helpers were Cathy Kraus, Theresa Potts, Bonnie Douglas, Bev Moss, and Jessica Nash. 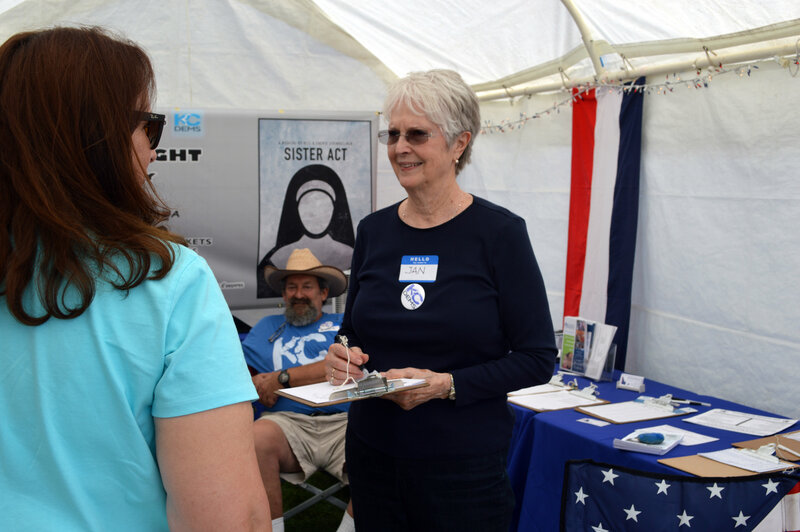 We so appreciate the work of the thirty-one volunteer-ambassadors who took one or more shifts, in hot weather and cool, to welcome visitors and engage in respectful conversation with people of diverse political views. 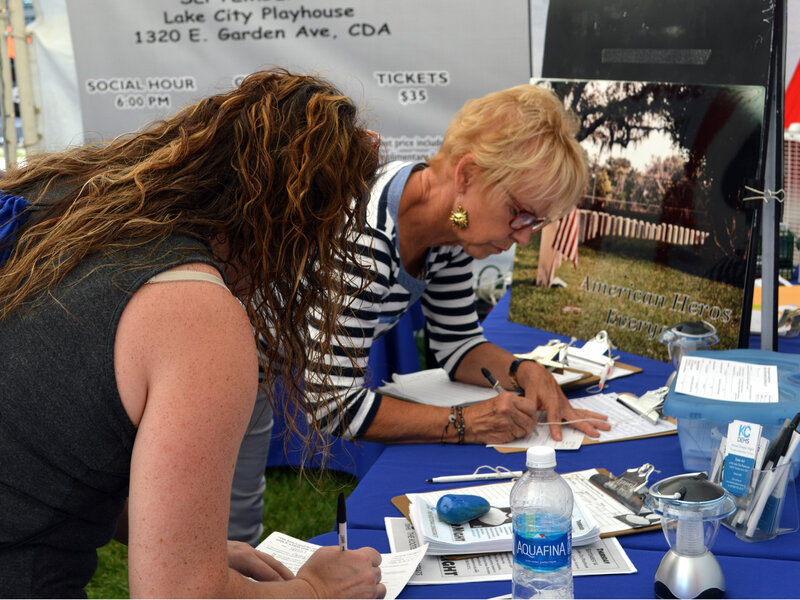 Finally we especially thank everyone who visited our booth and encouraged us to continue our work to make our Democratic presence known and connect with voters in Kootenai County. We look forward to our next event to bring Democrats together! Great article and photos! Thanks to all who participated! Great article! Informative and helpful for some of us that didn’t make it this year. Thanks to all those that helped and supported. Thanks Paula & Larry for the article and posting on the website. The Rs flack was minimal & extremely manageable.